Grape harvest! And our first real harvest. When we came here, the vines had been left unpruned for some time and we had to cut them right back to a manageable size, taking away most of the previous year’s new wood (ie. the next year’s fruiting wood) because it was all too far from the main stem. This meant a very meagre harvest in our first year. Last year, the late rains in May did for pretty much the entire valley. The combination of heat and rain are perfect conditions for fungal diseases to flourish and the young fruit rotted as it formed, regardless of whether it had been doused with chemicals or just left, as we did. 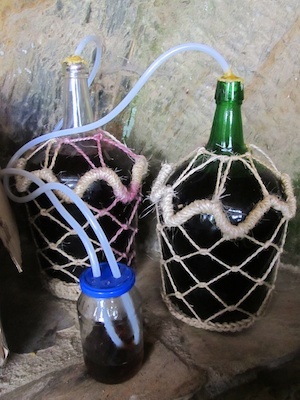 But being busy with building, it wasn’t so much of a disaster and we still had grape juice left from the previous year. This year we’ve had a decent amount. There are still many vines in desperate need of some TLC to bring them back into best fruiting condition, but it’s going to have to wait until we’ve completed most of the building and can concentrate on growing full time. In common with many quintas in this area, Quinta do Vale is planted with many traditional grape varieties of the Dão region, all mixed together with white amongst the red. 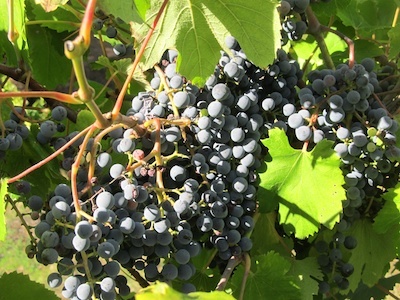 No two adjacent vines appear to be the same variety. I’ve been able to identify with reasonable, but not absolute, confidence Jaen, Rufete and Alvarelhão amongst the reds but there are more. Whites include Bical and Malvasia-Fina, both early-maturing varieties, but again there are more. If I’d had my head focused on the grapes rather than the cob bathroom, we’d have got the white grapes in sooner because they’d mostly gone over by the time the reds were ready, but we have a lot more red than white so it was them that determined the harvest. 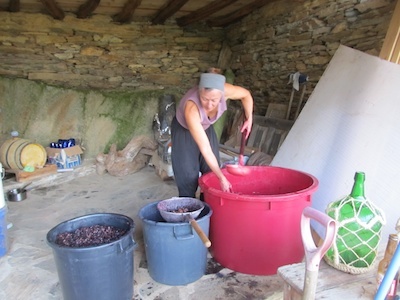 I thought I would try making some wine this year, along with juice and maybe jelly and … but in the event, lack of time, facilities, jars, bottles, corks, meant that putting it all to wine was by far the simplest thing to do. Ooni and I brought the harvest in over the weekend of 6th-7th October which seemed to coincide with most of the rest of the village. 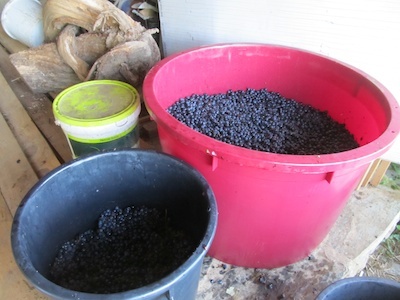 We stripped the grapes from their stalks – partly because I didn’t want the stalks tanniny bitterness and partly because we don’t have a wine press so would have to strain the must by hand after primary fermentation – then trod them in small batches, filling the 235 litre dorna about half full. This was then left to ferment for 5 days. Due to our complete lack of preparation for serious winemaking, we’ve ended up pretty much winging it all the way which isn’t really what I wanted to do given how many barely drinkable home brews I’ve sampled in the area. It would have been nice to have been a wee bit more scientific and used a hydrometer to make sure we had the sugar levels right, etc, but taste buds and a total absence of experience were the sum of it. Since I had no suitable secondary fermentation vessels, I bought a new 50 litre chestnut barrel from the local coopers rather than mess about with large numbers of demi-johns. It seemed likely we might have more than 50 litres of wine, but for the rest we’d have to improvise. Chestnut is reckoned to be second only to oak for its suitability for making wine, but the wood is more porous than oak and breathes more, resulting in oxidation of the wine if it’s left for too long in the casks. Because of this, new barrels are sold with a paraffin wax coating on the inside. I really couldn’t see the point of using a wooden barrel with this coating – you might as well use stainless steel or concrete fermentation vats for all the difference it would make to the flavours of the wine. Since we were already winging it, there seemed little to lose in introducing yet more ways for the vintage to go wrong, so we washed the barrel out with hot water and melted out the wax. This left a barrel with the most delicious nutty aroma, but what to do about the porosity? 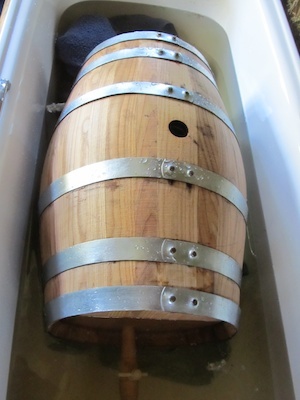 After soaking the barrel to prepare it for the wine, I hit on the idea of coating it on the outside with beeswax. If nothing else it would surely slow down the rate at which air moves through the wood by blocking the pores on the surface. Maybe even some of the aroma of the beeswax would make it into the wine? So I melted some beeswax and rubbed it into the surface of the barrel with an old T-shirt. It came out looking like it had acquired some nasty skin complaint, but this is definitely an instance where utility trumps aesthetics. 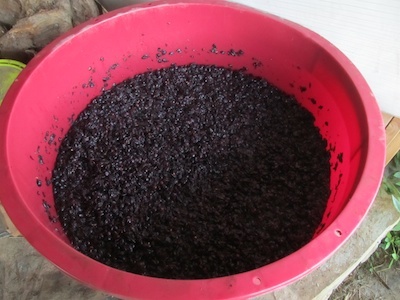 This weekend we separated the wine from the must, using an old and large industrial-strength sieve I found at a local flea market in which to squeeze the juice from the skins and pips, and strained the juice again before putting it into the cask. The only fermentation lock I’d been able to get at the local agricultural cooperativa had been one designed for use on a stainless steel fermentation vat. Initially I fitted it to the barrel, but something about it kept bothering me. How was it supposed to work? The tube coming up into the lock from the barrel comes almost all the way to the lid, so if liquid is put in the lock for CO2 to bubble through, like any ordinary fermentation lock, it can’t because the tube would exit above the surface. Similarly, the tube exiting through the lid begins almost at the bottom of the vessel. Gasses can’t vent from below the surface of a liquid. And if this is meant to work without liquid, how does CO2 exit without air getting in? This is like no fermentation lock I’ve ever seen, so if anyone can tell me how it’s supposed to work, I’d be very grateful. Meanwhile, I made my own. Some silicone tubing exiting from the fermentation vessel and bubbling through aguardente in a glass jar. The tubes are held in the bottles by bungs made from tightly-wrapped clingfilm and sealed with beeswax, and then pass through the lids of the jars which are perforated to allow the CO2 to escape once it’s surfaced from the tubes bubbling out into the aguardente. This style of fermentation lock has the added advantage of being able to accommodate several fermentation vessels, which is just as well as we had another 30 litres of wine after filling the cask to find suitable containers for. 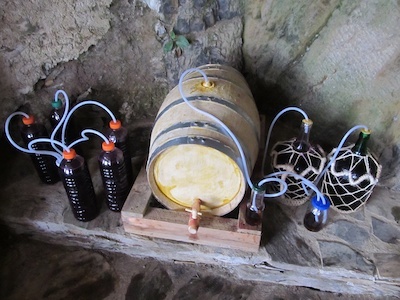 After filling the chestnut cask and two 5-litre garrafões, there was nothing for it but 2-litre PET bottles. 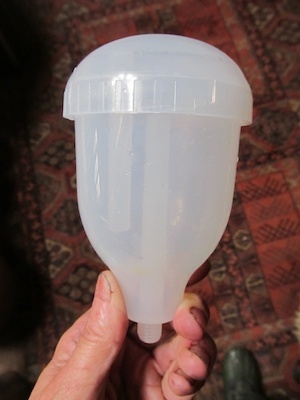 (So much for the careful choice of container and the delicate aromas it would impart to the wine …) And after filling all 5 of them that were lying around – all using the one fermentation lock and looking like something out of Doc Brown’s DeLorean rather than anything oenological – there was still a good 10 litres left. We really were scraping the barrel with the plastic bucket. Hints- insted of fermentation lock you can use some oil on surface, enough to keep wnie away od air. Good shadow is strongly recomended to pre vent oxydation of oil, of course. The beauty of making wine is in the sharing of the end result. If you start with ripe healthy fruit you’re likely to end with a pleasurable beverage, mix in a few friends to celebrate the event when it’s ready to sample and you’ll fell like an accomplished wine maker. Love your treatment of the Chestnut barrel. Chris I bought a chestnut barrel at the recommendation of the cooper as chestnut is more usual in Portugal apparently. He reckoned oak puts too much tannin flavour in the wine. He said oak was better for aguardente, especially since his oak casks are made from old Scotch whisky barrels. I’ve never heard of putting oil on the wine, though I can see how it would prevent oxidation. Interesting! The 10 litres we had to put in a plastic bucket I put clingfilm on the surface of for the same reason, but oil would be more effective. I might well give it a try. Joaquim, I couldn’t agree more! The sharing is the best part … always provided it’s drinkable. Truth; Wine making can at times seem like some kind of a secretly kept alchemy but the reality is far from that. Starting with healthy ripe fruit. 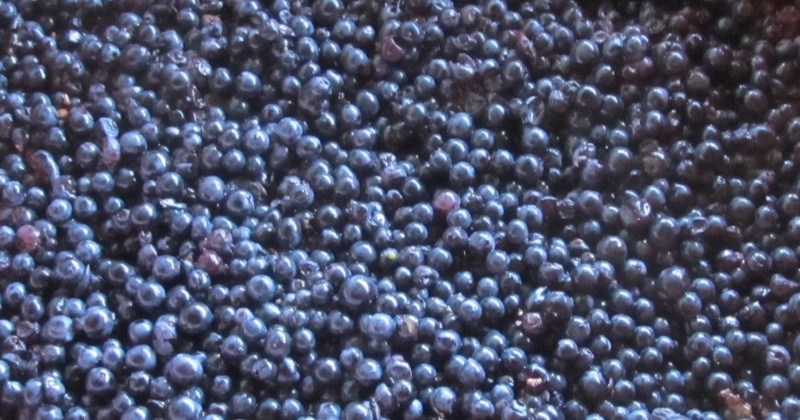 Crushing it then fermenting it in a clean container will pretty much guarantee you success. Letting the wine settle and mature in wood rather then any other kind of vessel will only change it’s organoleptic characteristics. It will not change it’s quality. You may like it better woody and can wait or you may like to drink it right away and can’t wait for it to settle. that’s all secondary. Good ripe fruit and a clean setup will also mean, no need for metabisuphte. The fail safe weapon of modern winemakers. :-) I hope so! But the question mark over drinkability is only because I’ve tasted so many homemade wines and found the experience less than wonderful. Often they are dry to the point of being astringent. Often they are vinegary. So I think there is a little more skill – or perhaps a sense of timing – involved. But I shan’t be using any chemicals here.